This dash tin was very difficult to photograph, due to glare/reflections and other anomalies that aren't there. Nevertheless, be sure to check out the pictures. You could also use this on a gear drive Cub (124, 104 etc) if you really wanted to, though there would be an extra hole you'd have to deal with. This is an air cleaner assembly for Cub Cadet Originals. I do not have the lower cover. Factory Second cub cadet mower/tractor seat. 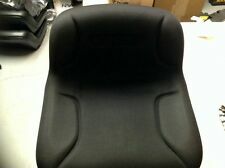 Seat is black in color, with velour material and logo. 3 bolt mounting. Seat is new and never been used. Seat may have indents from storage but will quickly fade. 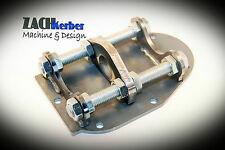 Hitch is made to bolt directly to the rear of a Cub Cadet transmission. This is a Hitch I designed for lawn tractors for you folks that want to improve your machines towing ability without using my receiver style hitches. It bolts on with a 5/8 bolt (included) right into the factory hole on your factory hitch. Top plastic slide piece sits flush with seat, other two do not, see pictures. This is a new seat, it has never been on a mower/tractor. Factory Seconds. 5-3/4" from each side bolt on up to top bolt. This is a new seat, it has never been on a mower/tractor. The local authorized dealer will perform a warranty inspection and submit their findings for claim approval and service. If there is warranty claim approved by the Manufacturer, the parts and labor to repair those defects will be covered under the warranty. Cub Cadet Tractor 71 102 122 123 Hood. Cub Cadet Tractor 71 102 122 123 Hood. . Condition is Used. Some surface rust, metal is not perfect. It bolts on with a 5/8 bolt (included) right into the factory hole on your factory hitch. The mount bolt is in a slotted hole so it will line up and set down on any factory hitchplate. I have 2 - 3/8 holes also drilled if you want to add 2 more bolts for stability. I hand crafted these out of the highest quality bronze to OEM specs on my CNC lathe. The bronze PTO wear button is a press fit just like the OEM style one part number 473483-R1. I manufactured these out of solid bronze because it's lubricating ability making them last much longer and far less wear to the thrust button. Trending at $87.88eBay determines this price through a machine learned model of the product's sale prices within the last 90 days. COMPARE FEEDBACK RATINGS - WE EXCEL WHERE OTHERS FAIL! MTD \ Cub Cadet PTO Deck Belt. The Model number is usually under the seat of your mower. Kevlar Belt -- NOT CHEAP CHINESE BELT! BEST PRICE ON EBAY WITH MOUNTING HARDWARE!! This mulch plate cover fits mtd, or cub cadet riding lawn mowers with 2 blade 42" 46" 2013 up models. NEW Mulch Plate Cover. Excellent for fall! No need to rake - mulch the leaves instead. MODEL NUMBER UNDER THE SEAT MUST START WITH 247. Belt Application: Drive. Belt Application: engine to transmission ! Premium Belt. Oil and Heat Resistant. Interstate Supplies and Services. Fits: Cub Cadet LTX1045, LTX1046 and LTX1046VT with 46" deck. Fits Cub Cadet Series 100 LTX lawn tractors with 46 in. decks, 2009 & after. Also Fits LTX1046. Replaces the following Cub Cadet part numbers. FOR SALE 2 NEW CUB CADET HOOD DECALS. FITS 1 HOOD MODELS 107 127 147 149. Based on the part #, this will fit the following models: 1000, 1200. when applicable. Item Size 190.00 lbs. Item Weight Part SKU#:CC-25360. Part Details. We are simply the best at what we do.